Onions, carrots, celery and garlic – as they can form the base for so many different dishes. Here, with a few extra store cupboard items, you can make a fantastic soup in no time. Feel free to puree or half-puree the soup, or leave it all chunky, depending on how you like it. Sometimes I add a few dried porcini mushrooms to make it extra special. Place a large saucepan (with a lid) on a medium heat. Add a lug of olive oil and the bacon. Fry slowly until the bacon has started to release all its tasty fat and goes crispy, then add the dried thyme, dried chilli, onion, carrot, celery and garlic. Cook gently with the lid on for about 15 minutes, until all the vegetables are soft, then add the lentils and 1 litre water or vegetable stock. Bring to the boil and simmer until the lentils are soft. (Check the packet instructions as different types of lentils vary in cooking time. 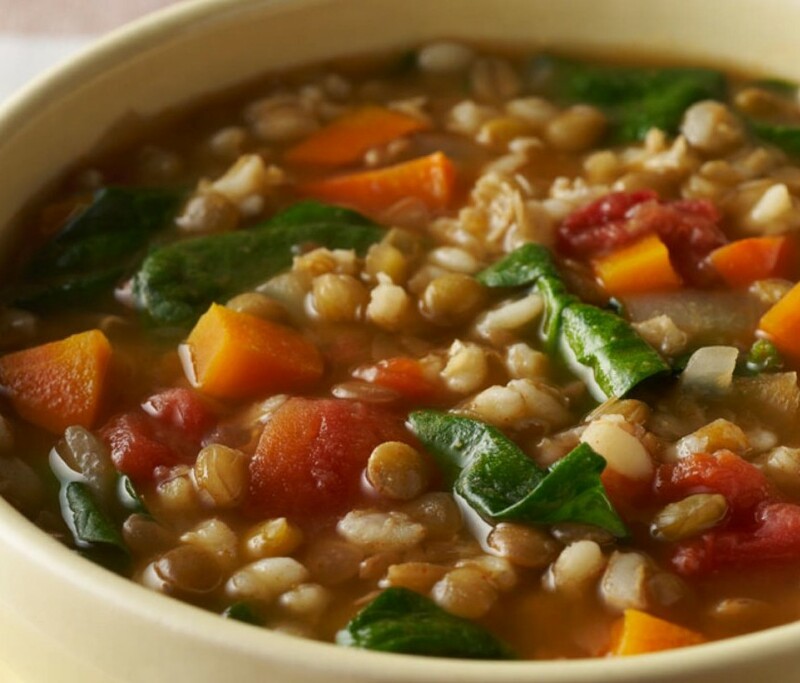 If you’re mixing your lentils, cook for the longest amount of time to make sure they are all cooked properly). Add the tin of cannelloni beans and, if the soup’s a little thick, some more water. Bring back to the boil and simmer for another 10 minutes, then taste and season with sea salt and freshly ground black pepper. Ladle into bowls and finish with a drizzle of extra virgin olive oil and the chopped parsley. Serve with hunks of bread.